What do you call a good version of “scarred for life”? There was an experiment some time ago where Students of a University were asked which lecturers had the most profound effect on their learning experience – 10 years after they’d left higher education. The names cited were rarely the ones that earnt the most, nor recognised for that achievement. I think I can relate to this in a couple of ways. One from my education at Theale Grammar School – situated in the village of Theale, just west of Reading, who’s previous status as the half way stopping point on the two day London to Bath Stagecoach run blessed it with more pubs per head of population than any other village in the country. These days they call that route the A4, supplanted in most use by the M4 motorway in 1971 or so. I recall four morning assemblies of the hundreds served in my 7 years there (more detail in the footnotes if those are of any interest). Secondly, while employed in my 17 years at Digital, I was blessed with many experiences that have had a material effect on several businesses since. The one standout has got to be two days spent in the company of John Winkler, who Paul Mears retained to take 30 of us through the art of Pricing; we did this in the surroundings of Newbury Racecourse in (I believe) 1992. The first day ended with an overnight exercise to come up with a list of ways we could treble our retained profits based on learnings so far. Instead of going straight home, I took a detour back into my office in DECpark Reading, sat in front of my 19″ VAXstation, and started hacking around our recent sales transactions. Got home late, but was armed brimming with ideas for Day 2. Looked like countless ways of doing it. Next day everyone gave their ideas, had some training on how to negotiate pricing, and were given guidance on how to behave in a price war. With that, the course finished, we thanked John and disappeared away into the night, armed with the training notes. Fast forward to when I worked for IT Distributor Metrologie. They had bought Olivetti Software Distribution a year or so earlier, and moved their staff into the HQ office in High Wycombe. They were, at that point, one of Microsofts five distributors in the UK, all of whom were conscious of the vendors desire to reduce their Distributor line up. The guy brought in to run the Microsoft Business elected to leave, and in January 1997, Metrologie got slapped with what’s termed a “Productivity Improvement Plan”; basic Microsoft parlance for the path to the Firing Squad. Well, that’s what the Directors knew – I wasn’t told. I was asked to park my other work and to go fix the Microsoft Business, and given a Purchasing Person who had ambitions to be a Product Manager, plus one buyer. We were doing around £1 million per month, 60% of the business through Dixons Stores Group, and (like most Microsoft distributors) tracking along at 1% gross margin. 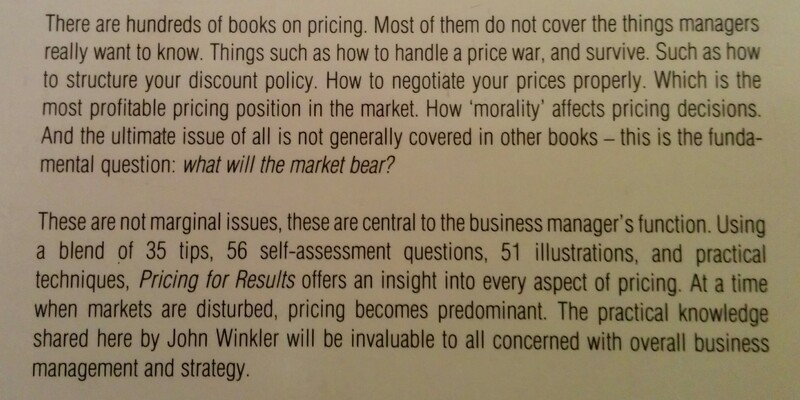 We employed the learnings from John Winklers Course – in particular the guidelines of how to behave in a price war – and it worked with a vengeance. While the DSG business didn’t grow, the overall business went from £1m/month to £5/month in four months, and at doubled margins. Due to the dynamics of how a Distribution business works, and major suppliers being very strict on payment terms, I learnt how “overtrading” feels at close range. But at that point, i’d been headhunted for a role at Demon Internet, but extended my notice by 4 weeks in an attempt to avert the Firing Squad which i’d since learnt about on the journey. We already found we weren’t being invited to Microsoft Social Events that our status should have conferred on us. I went into a meeting at Microsoft with my Chairman and the Group Marketing Director from France; their body language going into the meeting was all wrong, and we were told that despite our recent performance, that Microsoft were going to lose us as a Distributor. We lodged an appeal, and I left to my new role in Demon Internet; Product Manager Tracy left shortly afterward to a Software Business Manager role at reseller BSG, doubling her salary in the four months we’d worked together. A week in, I got a phone call from my immediate ex-boss, Bob Grindley, to be told that the Microsoft Contract had in fact been retained. I learnt one set of very useful guidelines on how to measure and improve any business from our then Microsoft Account Manager, Edward Hyde, early in my time in that role – the core ones I still use to this day. 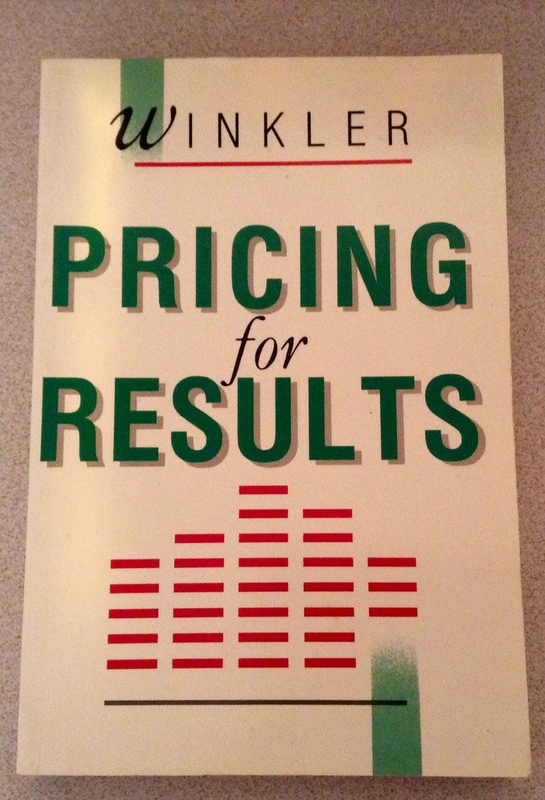 That apart, the work on pricing I learnt from John Winkler made a material difference; I can think of no other reason that it took 4 months to grow the business 5x in revenue and 2x in margin in the middle of a 5-way price war. 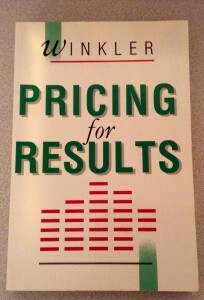 The dirty secret is that the 2-day course is condensed into a paperback book entitled “Pricing for Results” by John Winkler himself. Now out of print, but if you’re quick, available for the princely sum of 1p plus postage from several third party sellers on Amazon. A real steal. Or you can hire me to assist with any business improvement project!